The challenge is acute. The European Commission said in 2010 that all young people should have the opportunity to have at least one practical entrepreneurship experience before leaving compulsory education. Today only around 20% do so. This is despite research showing that just 100 hours of entrepreneurship education has significant positive impact on not only entrepreneurial competences and intention but also students’ motivation, school performance and grade point average. Other Member States, without strategies today, are moving fast. 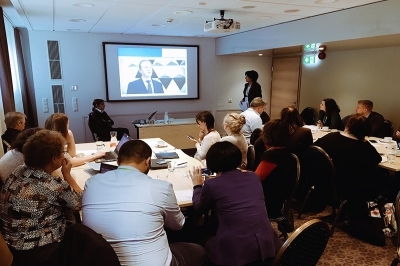 Bulgaria, Hungary, Romania, and Slovakia and are using the EE-HUB network for support to shape and implement their entrepreneurship education policy. Encouraged by this momentum, round table participants renewed their sense of commitment to entrepreneurship education and agreed to intensify their efforts. They would like to see more attention placed on measuring progress and establishing benchmarks at national and local level. They explained that the issue is not necessarily a lack of resources but a problem with how effectively they are used. Content is available but teacher training is far from where it needs to be. It is rare to have a forum like this where Ministries can exchange experience and expertise. While there is a great deal of work being undertaken on policy generally, entrepreneurship education, being newer, needs specific attention. There had been good progress on cross-ministerial collaboration but specific focus was needed. Ministries of education have to take the lead and bring together other relevant ministries by acting as advocates for the importance of entrepreneurship education in relation not only to education but also to employment and economic growth. Whilst the content of entrepreneurship education had developed with countries increasingly embedding it across all subject areas, there is a need to build the capacity of schools so that they can plan it within the curriculum. In countries where education is decentralized and schools have wide-ranging autonomy, schools need support to structure entrepreneurship education as multi-disciplinary work promoted consistently and systematically across all dimensions of school life including extra-curricular activities and teacher training. There has been slow progress in monitoring entrepreneurship education activities with particular difficulties in measuring penetration rates. There is a need for a common definition that keeps in mind variations in the type and intensity of entrepreneurship education activities. Very good progress in terms of resources for entrepreneurship education was reported but participants noted a lack of capacity from municipalities and schools to access them. Headmaster and teacher training were identified by many as one of the main constraints on the uptake of entrepreneurship education in schools. o Raising awareness and advocate for entrepreneurship education. “Thanks to platforms like EE-HUB, more and more national governments are realizing the tremendous value they can derive from increased investment in EE, both for individuals and the economy. For the first time, we have important impact data in our hands and we are talking together about benchmarks. There is more momentum than ever,” said Caroline Jenner, CEO of JA Europe. EE-HUB is part of the #SwitchOnEurope advocacy campaign, which aims to raise awareness of the European goal, set in 2010, that every young person should have a practical entrepreneurial experience before leaving compulsory education. JA Europe is Europe’s largest provider of education programmes for entrepreneurship, work readiness and financial literacy, reaching 3.6 million students in 40 countries in 2017.